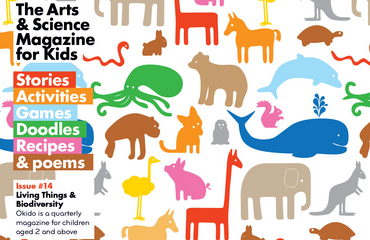 DD2 has just received her first issue of Okido, the arts and science magazine for kids. She is 3 and has enjoyed reading through it together. Her 7 year old sister is jealous and keeps walking off with it. The illustrations are beautiful and very varied. The writing has them both engaged. Each themed issue, our first is biodiversity, includes stories, facts, puzzles, comic strips, things to make, games and puzzles. It is quirky and very different to mainstream mags.